Saint Francis was born in the little town of Assisi in Umbria, Italy in the year 1182. His father, "Peter Bernadone", was a wealthy merchant and his mother, "Pica", was gently of Provencal blood. Much of his father's trade was with the French and his son was born while he was on one of his business trips in France. Perhaps for this reason St. Francis was called Francesco, translated as "The French Man". St. Francis of Assisi, seemed to be destined to becoming a wealthy merchant himself until he experienced a series of life transforming events which would reshape his destiny and his life. In an early yourhful encounter, St. Francis caught up in his own self ambition encounters a beggar which he doesn't have time to bother with and so promptly dismissed him out of hand. Shortly thereafter Francis is troubled by his own conscience and his early philosophy of "Openhearted Compassion for the Poor" continues to develop at this point. This single event most likely had the greatest impact on the heart and mind of St. Francis as it initiates a genesis of his own personal calling to serve God by serving the needs of the most distressed of humankind. So intense became the fervor of St. Francis to follow Christ that St. Francis began long periods of fasting and giving all of his material posessions away at the sight of anyone less fortunate than he. When St. Francis comes upon an old church broken and in ruins on the outskirts of his own hometown he encouters a divine vision in which he hears God command him to rebuild the old church. Francis is so driven by the vision that he sells whatever remaining material goods he owns along with some of his own father's personal property to generate the needed rebuilding revenues for the supplies and reconstruction project which he sucessfully accomplishes. 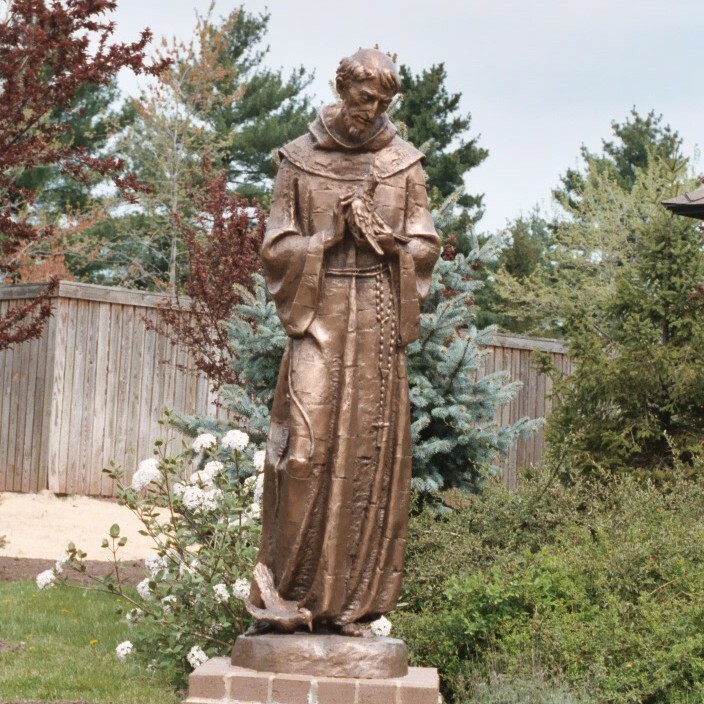 The Love that defined the life of St. Francis continued to grow as he himself evolved in discerning the difference between genuine divine guidance and his own fervent need to bring all of his inner strength to bear on his devotion to the service of Christ. Over his rather short life St. Francis truly became transormed into the image of Christ even displaying the wounds of Christ known as stigmata. St. Francis saw the calling of God in the lepers and the crippled and he served to heal them. He heard God calling in the homeless and destitute and so keeping the Love of God in his heart, became one of them. St. Francis beheld the vision of a crumbeling abandoned church and was likewise inspired to rebuild it stone by stone from the ground up. 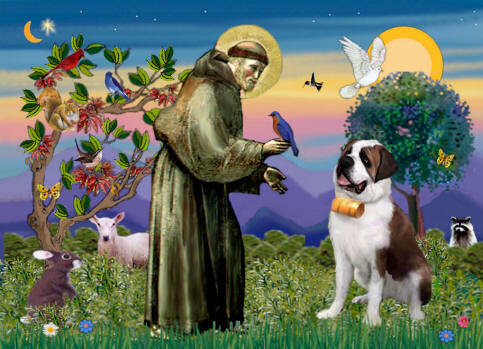 St. Francis lived an exemplory life of single minded devotion and so inspired those who were in turn led to follow his example leading all the way up to the current day where he continues to be an example of "A Life lived on Purpose". Saint Francis' final years were filled with suffering as he himself desired and prayed to share personally in living a life pleasing to God. His many years of wandering in devotional service and poverty finally caught up with him and as he became ill and began to go blind, he composed the beautiful final tribute to the divine in his "Canticle of the Sun" which expresses his kinship with all creation in praising God. 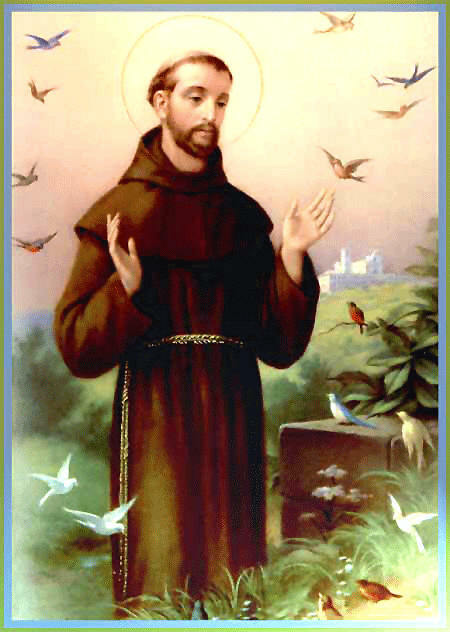 Saint Francis died on October 4, 1226 at 45 years of age. 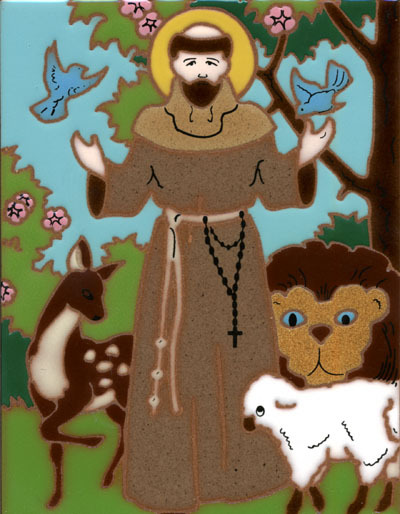 St. Francis is considered to be the founder of all Franciscan orders worldwide and the Patron Saint of Animals and Ecology. His celebratory Feast Day is held on October 4th. 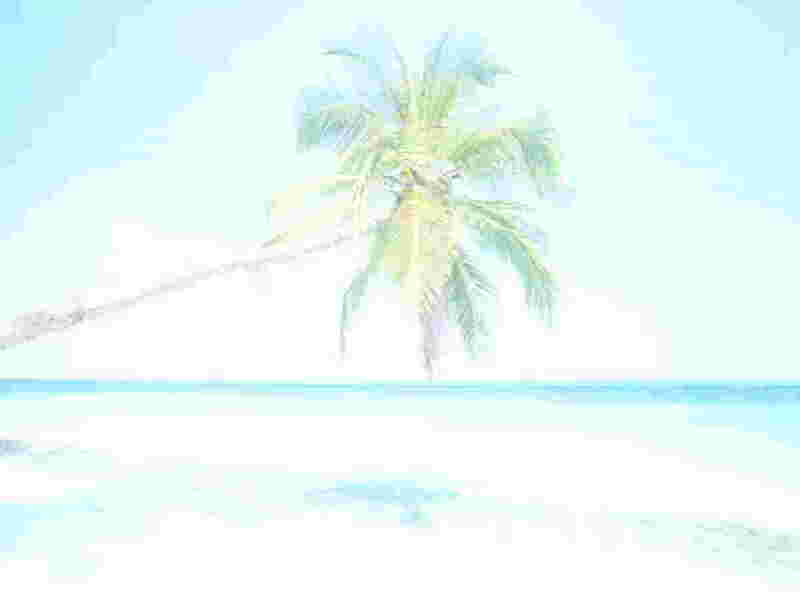 "The Prayer of St. Francis" is an internationally recognized prayer which first appeared around the year 1915 A.D. and which embodies the spirit of St. Francis of Assisi's life of simplicity and poverty. The Peace Prayer of St. Francis first appeared during the First World War and was found written on a holy card of Saint Francis. The original prayer apparently bore no name but with it's appearence on the St Francis holy card, soon became known and entitled as; "The Peace Prayer of St. Francis". Woe to those who die in their sins..! 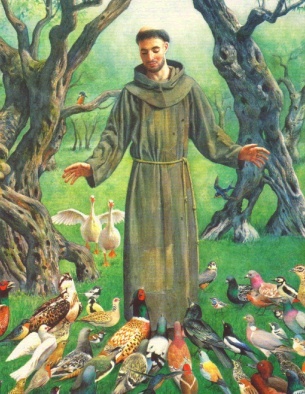 Of course without realizing all the precepts in the life of St. Francis anybody caught talking to birds might be propositioned to get medicated but learning about the life of Francis and his devotion to God's creatures gives this special sermon all the credibility needed to be an inspiration to anyone. 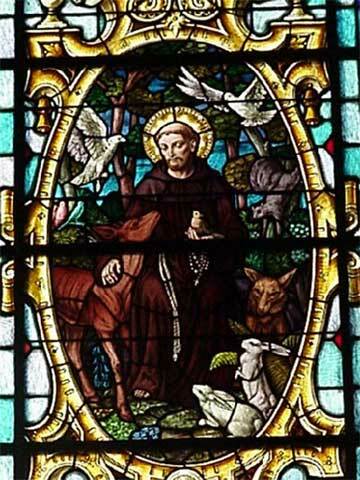 Since it has been reported in many of the writings about St Francis, that he was known to speak to creatures particularly in the nearby arena of his fellow monks in the order of Friars he himself founded, it's easy to picture St Francis imparting guidance and teachings to his followers by instructing the birds in this sermon. I keep that in mind as I read the words and it seems to increase the value of every word spoken here. Much burden are you to God, your Creator, and always in every place ought you to praise Him for that He has given you liberty to fly about everywhere and has also given you double and triple raiment. Moreover he preserved your seed in the ark of Noah, that your race might not perish out of the world. Still more are you beholden to Him for the element of the air which He has appointed for you beyond all this. "If you have men who will exclude any of God's creatures from the shelter of compassion and pity, you will have men who deal likewise with their fellow men..."
from the film "Brother Sun, Sister Moon"
Brother Sun, Sister Moon (italian: Fratello Sole Sorella Luna) is a full length movie produced in 1972 directed by Franco Zeffirelli and starring Graham Faulkner as Saint Francis and Judi Bowker as Saint Clare. The film is a biography on the Life of Saint Francis of Assisi. Zeffirelli directs a brilliant film tribute to the much beloved Saint Francis featuring breathtaking photography shot in the most sublime terain of Italy and Europe. "Brother Sun Sister Moon" directed and produced along the lines of Zeffirelli's Academy Award winning adaptation of Romeo and Juliet filmed in 1968. "Brother Sun Sister Moon" portrays the life and philosophy of Saint Francis of Assisi and accompanied by the timeless vocal renderings of "Donovan" is a film not to be missed at every opportunity. "MAY GOD HOLD YOU IN THE PALM OF HIS HAND..."
ST. FRANCIS PAGES "The Prayer Foundation"
THE WRITINGS OF ST. FRANCIS "The Franciscan Friar Order"
ST. FRANCIS OF ASSISI "The American Catholic Org"
Prayer of St Francis "St. Francis of Assisi Biography" Words of St Francis of Assisi "Canticle of the Sun Saint Francis"